Cask: Unfiltered; Bottle and Keg: Filtered. Regularly available. Has been sold at 6%, 6.7% and 6.5%. Breakfast stout with a gentle touch of smoke, coffee and chocolate. Broken Dream is deep and complex. She lurks in your imagination. She binds smoke and coffee aromas with chocolate, milk and oats to create something thick, velvety and slick. She will draw you towards a land of flavour, passion and colour. UPDATED: APR 20, 2019 Aroma of bread, toasted malts, vanilla, raisins, and earthy berries. Taste is burnt toast, molasses, vanilla, nutmeg, raisins, and coffee. UPDATED: APR 16, 2019 Fat @ Waterloo tap. I stort sett svart öl med ett lätt mörkbeige skum. Doft och smak av rostad malt, kakao, choklad, lättare kaffetoner, mjölksockersötma och lätta lakritstoner. UPDATED: APR 9, 2019 19 March 2019. At Hanging Bat, Edinburgh. Shared with the lovely Anke! Cask. Pours cloudy black with a lasting, thin, unstable, foamy, dark beige head. Aroma of coffee roast, chicory, fondant, earth, walnut, wet leaves, blackcurrant, old toast. Taste is light malty sweet, restrained chocolate, nuts & bread, quickly building up a medium roasted bitterness with pure coffee roast, chicory earthiness & powdery fondant, vague umami (black) olive & sourish accents of dried, dark fruits complementing well. Dry, earthy hoppy finish, lingering toast, coffee ground, faint ash. Medium body, oily texture, soft carbonation. Pleasant 'breakfast Stout', could have been a bit thicker though palate- and tastewise. UPDATED: MAR 13, 2019 Dark brown colour, almost black. Clear brown head, two fingers, good retention. Impossible to see the carbonation through this darkness... Palate between watery and oily. Aroma is roasty, herbal and almost smoky coffee, oats, traces of chocolate in the background. Taste is milk chocolate, coffee with milk, roasted notes, traces of dried fruits. Sweet. Roasted end with soft bitterness and strong ashy notes in aftertaste. Not particularly original/memorable but obviously good and enjoyable. UPDATED: MAR 9, 2019 Bottle. Malty aroma, roasty notes, coffee. Tastes the same as aroma, medium bitter. Medium to full body, malty coffee bitter finish. Ok. 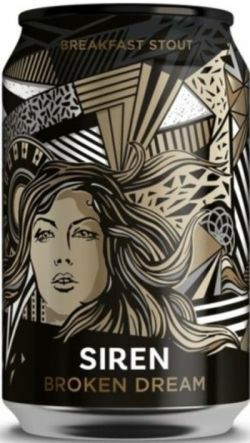 UPDATED: MAR 6, 2019 Bottle from BrewDog online store. Decent stout. Clean, coffeish, roasted malts and coffee beans. Feels really easy. Good morning! UPDATED: FEB 13, 2019 God og spænde stout. Masser af fylde. Tilpas bitterhed og søde. Indbydende aroma.